Make-A-Wish® Greater Bay Area was founded in 1984. In its first year, a total of 27 wishes were granted. Now one of the largest chapters nationwide, we have granted over 6,000 wishes to date and grant over 340 wishes per year. Make-A-Wish®Greater Bay Area is a 501(c)(3) non-profit organization that fulfills the wishes of children between the ages of 2 1/2 and 18 battling life-threatening medical conditions. 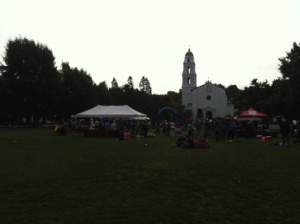 Walk For Wishes is a family-friendly 5k walk, held in the East Bay at St. Mary’s College. Participants can remember a loved one by dedicating their walk to them, or simply walk in support of all Bay Area wish children. The walk included breakfast, kids’ activities, fundraising incentives, prizes and more. Participating in Walk For Wishes is free for everyone, but fundraising is encouraged. 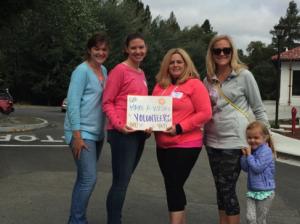 The Junior League of Oakland East Bay partnered with Walk For Wishes to provide course monitor and encourage the participants. We were greeted by warm and friendly volunteers and had the opportunity to meet and work with Daniel Marlay, Volunteer Manager and Janette Kennedy, an event staffer. Our Junior League members worked alongside others in the community donating their time to Walk For Wishes. We held signs honoring specific families and make a wish children, cheering them on and had a great time interacting with the families during the walk. The Walk For Wishes event was an amazing experience and we look forward to working with the in the future! Heather Craig and her daughter, Shelby Swartz, Hilary McQuiston-Fall, and Noelle Tuominen on the Walk For Wishes course. 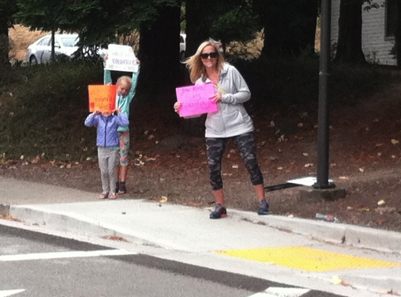 Heather Craig and her daughters showing off their signs to support the walkers. The Walk For Wishes event!